The EV3 300 and EV3 700 range of digital modules for basic ovens used for gastronomy, bread and pastry-making offers an advantageous alternative to the electro-mechanical devices for temperature and timing management (cooking timer and steam injection). 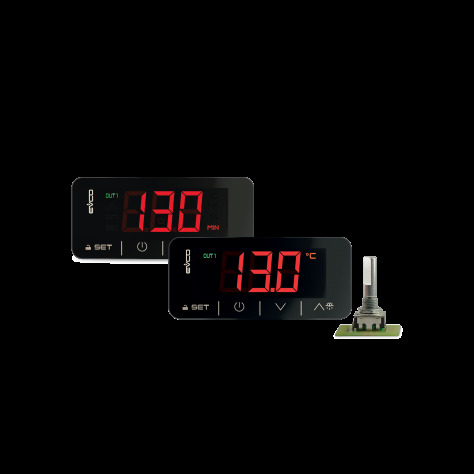 As well as providing more precise regulation that can always be monitored from the display, these modules enable the unit to save energy by on-off or PID temperature control. The format is standard 74 x 32 mm with reduced depth and an IP65 front with a continuous surface. Models are available with capacitive keys or a push encoder for even faster and more intuitive operations. The push encoder can also be built into models with keys as an optional extra. Plug-in screw terminal blocks (fixed-screw as standard).